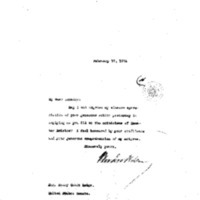 Woodrow Wilson writes to Henry Cabot Lodge thanking him for his letter of the previous day. May I not express my sincere appreciation of your generous action yesterday in replying as you did to the criticism of Senator Bristow? I feel honoured by your confidence and your generous comprehension of my motives. Wilson, Woodrow, 1856-1924, “Woodrow Wilson to Henry Cabot Lodge,” 1914 February 19, WWP18362, First Year Wilson Papers, Woodrow Wilson Presidential Library & Museum, Staunton, Virginia.